A lucky man. A lot to live for. A tough break. Lou Gehrig. ALS. 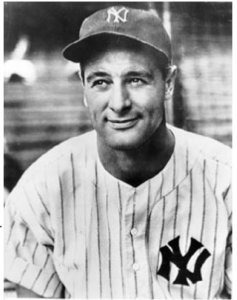 Gehrig’s name has become synonymous with Amyotrophic Lateral Sclerosis. I wish it didn’t. I wish he never had ALS. I wish when we think of him it is in the context of being one of the best Yankee’s of all time – not ALS then baseball. Baseball is awesome, ALS is not. “Fans, for the past two weeks you have been reading about the bad break I got. Yet today I consider myself the luckiest man on the face of this earth. I have been in ballparks for 17 years and have never received anything but kindness and encouragement from you fans.